United Airlines wants to cut delays. Its solution: Fewer lines. The airline on Tuesday changed its boarding process: United reduced the number of boarding lines from five to two. Passengers in groups one and two will board in a single line. Remaining passengers will be asked to remain seated until they are called to board through the second line. They'll be announced by group. The new procedure is part of a long-term effort boost ticket sales. United (UAL) hopes to please passengers by eliminating long lines at the gate, said Jack Atkins, a research analyst at Stephens Inc.
United's reputation with fliers faltered after Dr. David Dao was dragged off a flight. The airline also came under scrutiny after a passenger's dog died in flight after a flight attendant said it must ride in an overhead bin. Improving the boarding experience is a low cost way to improve United's customer service, Atkins said. New boarding procedures have helped its competitors. Delta (DAL) has over the past several years boosted its on-time numbers, which has allowed it to boost its profit and to attract new customers, Atkins said. Over time that allowed them to hike fares. That's what United is shooting for. United Airlines hopes fewer boarding lines will mean less waiting for customers. "It won't be faster, but the gates will be less confusing and have less of a cattle barn look," said Mike Boyd airline consultant at Boyd Group International. "The old procedures induced people to stand in line an hour ahead of time. 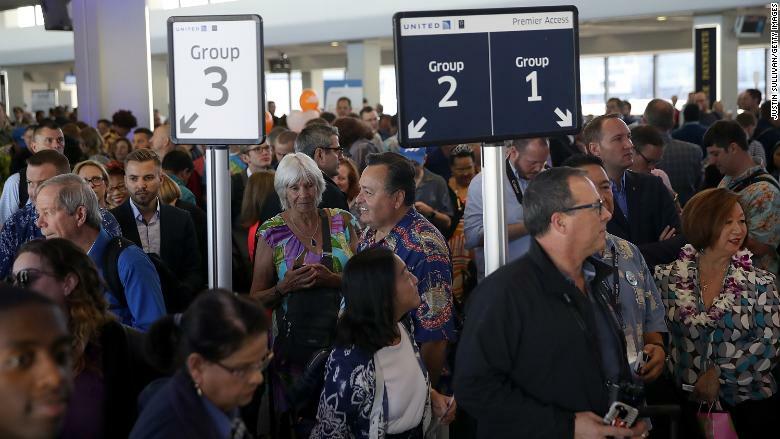 This will be much better, but what people in Group 2 are going to do is still stand in their line an hour ahead of time to get overhead bin space." The overhaul was requested by a large number of customers, said Sarah Murphy, United's operations strategy chief, in a statement. The move is the latest in a series of changes United has made to improve its customer experience. It has also changed its ticketing methods to reduce the number of passengers bumped off flights. it also automatically compensates passengers $1,500 for permanently lost bags.